Bang Po Beach is located on the northwest corner of Koh Samui, between Maenam and Nathon Town, northwest and removed from the most popular tourist areas. This quiet stretch of beach is often visited by local youngsters and recreational fishermen. 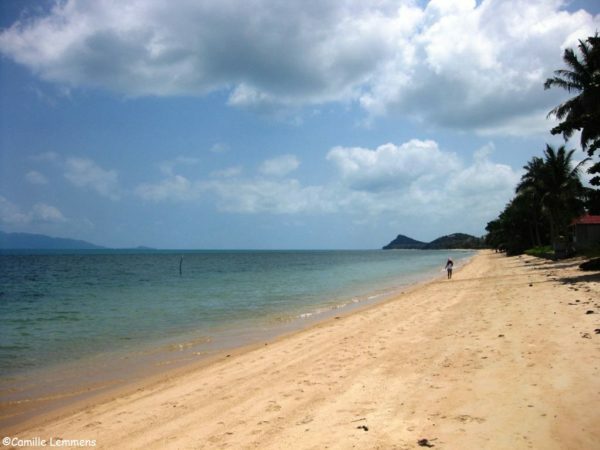 The beach is four kilometers long and faces to the north with views of Koh Phangan. The views of Bang Po are very picturesque – that’s clear as soon as you arrive. The bay looks out over Koh Phangnan, and is secluded by natural rock formations at either end. The sand is soft and white and the sea, churned by gentle winds, keeps the soft waves rolling to pleasantly audible effect. The warm waters are great for swimming, and the breeze makes this one of the best locations for sailing all year round. The waters are calm in this area of Koh Samui and the beach is very clean. Palm trees line the edge. There are shallow coral reefs nearby which provide excellent snorkeling. This beach is an ideal spot for snorkeling to the crystal clear underwater world of colorful coral reefs. There is not much development in this area. Very limited accommodation, no tourist shopping or nightlife. The price for land in this area is less than other areas of Koh Samui. The result is many housing developments with houses for sale and rent. The road in this part of Koh Samui is very close to the ocean and quite hilly. Bang Po is developing more of a community feel these days as an increasing numbers of international visitors choose to permanently set up home here. There are a number of emerging health centres for people who want to invest their time in intensive programs of detox and holistic healing, and the location is also home to one of Koh Samui’s finest schools. Bang Po is right by the sea and so provides an array of well served restaurants, providing fresh fish daily, cooked in a variety of styles. You’ll see the catches being brought in each day and the chefs choosing the prime choices for that day’s cooking. Guests can always ask for their fish to be cooked in a certain way, so don’t feel restricted by the menu.